Going in Style is an easy movie to follow that will make you laugh from beginning to end. They were able to bring a more lighthearted view to a serious issue that many seniors face today, living longer than you can afford to. 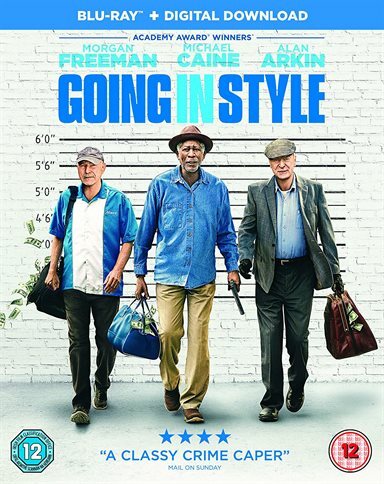 There won't be many movies this year that will boast a better lineup than Alan Arkin (Grosse Pointe Blank), Michael Caine (Inception), and Morgan Freeman (Wanted), but Going in Style sure does that. Based on the 1979 Martin Brest movie of the same name, Zach Braff's comical remake sees the three lifelong buddies, Willie (Freeman), Joe (Caine) and Al (Arkin) suffer a series of knocks in their later years of life. Faced with the prospect of being broke and having nowhere to live (due to a winding up of their pension fund and a foreclosure on Joe's house), times are becoming desperate. With their backs against the wall and nothing to lose, the aging trio decides to do something about it, something to make their lives worth living again and, quite drastically, decide to rob a bank. Joe, having previously witnessed the bank being robbed, recruits his best friends to become his partners in crime. Though, after an attempt to shoplift the night's dinner at the local supermarket ends hysterically wrong, you hold out little hope for the three of them to succeed in their ultimate plan. Knowing this, they seek the help of Jesus (John Ortiz) whose expertise is needed to guide them through to what will hopefully be a happy retirement. Hot on their heels is FBI Agent Arlen Hammer played by Matt Dillon (Wayward Pines) who, you get the feeling, knows exactly what happened but he hasn't got a shred of evidence to prove anything. Other notable mentions - Josh Pais's idiotic bank manager Chuck Lofton (you can't help but laugh at him) and Milton, who is plagued with dementia played by Christopher Lloyd (Back to the Future). Coming after Garden State and Wish I Was Here, "Going in Style" is Zach Braff's third movie and it is also his best to date, and easily the funniest movie I've seen this year. The witty one-liners and slapstick are a throwback to a yesteryear which gives the film a sort of a homely feel, tied together with the on screen antics of Arkin, Caine, and Freeman. Although the script may be lacking a bit of substance here and there, it does not detract from the flow of the movie, especially as the sound track will have you tapping a foot or two. The one disc Blu-ray comes with a commentary with Zach Braff and some deleted scenes. I always enjoy directors commentary and deleted scenes are sometimes a waste a time, but these were still entertaining, even though they didn't make it into the film. All in all, Going in Style is an easy movie to follow that will make you laugh from beginning to end. They were able to bring a more lighthearted view to a serious issue that many seniors face today, living longer than you can afford to. I always love seeing veteran actors team up for films and I was looking forward to seeing this trio perform together. I was not disappointed, as they were a pure pleasure to watch. Download Going in Style from the iTunes Store in Digial HD. For more information about Going in Style visit the FlickDirect Movie Database.